Guess the #1 reason why guitarists struggle to express their emotions through music? Is it because they lack talent? Or maybe because they don’t know enough scales and licks? Wrong! The biggest reason is that they don’t even try to improve the expressiveness of their guitar playing. “Musical expression” is a skill like any other. You can practice it, improve it and master it…if you go about it the right way. Likewise, you can keep struggling to express yourself with your guitar playing if you neglect this skill, or practice it incorrectly and ineffectively. The vast majority of guitar players focus their attention on what notes (or licks) to play vs. how to play them in the most expressive way possible. Most think that if a lick doesn’t sound good, they have to change some or all of its notes to make it cool and expressive. Fact is, any guitar lick can become an amazingly expressive lead guitar phrase….if you know how to mine the “emotional gold” from it. Understand that the notes of any guitar lick make up (at most) only half of the emotion it expresses. The other half (or more) is determined by how you play those notes. Using more than one style of vibrato (there are at least 4 types of vibrato you must explore and master - more on this below). …and many more possibilities that most guitarists never explore, simply because they don’t challenge their creative mind to discover them. Your lead guitar playing creativity is like a muscle - you must push yourself daily to develop it if you want it to grow. If you struggled to come up with a lot of cool sounding variations, you are not alone - most guitarists find this hard to do. The good news is that you can easily improve this area of your guitar playing and become a much more expressive musician. To learn how to do this, get this free eBook about adding fire and emotion to your guitar licks. Group 1: Guitarists who don’t practice vibrato at all. Group 2: Guitarists who practiced vibrato in the past but stopped working on it, because they think they already mastered it. This assumption makes it impossible to fully express yourself with your guitar playing. Group 3: Guitar players who consistently focus on refining their vibrato (even after they already know how to do it well). These guitarists improve their lead guitar skills a lot faster and become much more expressive musicians as a result. To maximize emotion in your guitar playing, schedule time for practicing your vibrato as you would practice any other technique. Read this article about practicing vibrato on guitar to learn how to do this. To make faster progress, seek out an expert guitar teacher who can show you how to master vibrato and integrate this technique with other lead guitar skills to make your guitar solos sound awesome. Any guitar lick you play sounds only as good as its final note. Most listeners (especially non-musicians) won’t be able to remember every note in your solos, but they WILL remember the sound of the last note in any lick you play. Most guitarists practice playing the notes that lead up to the final note cleanly and accurately, but fail to make the last note sound awesome. This makes it impossible to express strong emotions in your guitar playing. 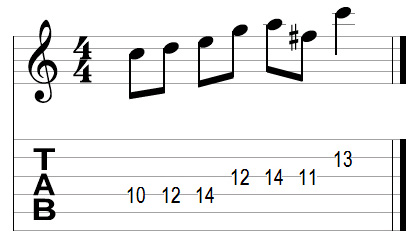 To fix this problem, focus specifically on ornamenting the final note of your guitar licks as you saw and heard in the examples shown earlier in this article. Now that you are aware of the most common mistakes that get in the way of you playing guitar with emotion, learn how to practice to add fire to your guitar licks and solos…even if you can’t play guitar fast yet. Download this free eBook about playing awesome guitar licks and learn how to maximize the expressiveness of your guitar playing.